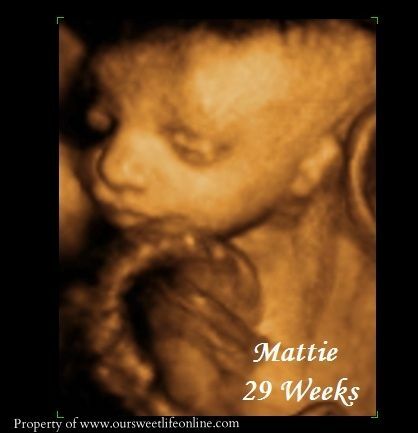 With less than 3 months to go before we get to meet this little girl, we were anxious to get another peek at her and just make sure she was really a she. Let's just say we got plenty of confirmation so we can get started on adding the pink. Mattie was not as cooperative during her photo session (more like her big brother Evan than her big brother Brody). 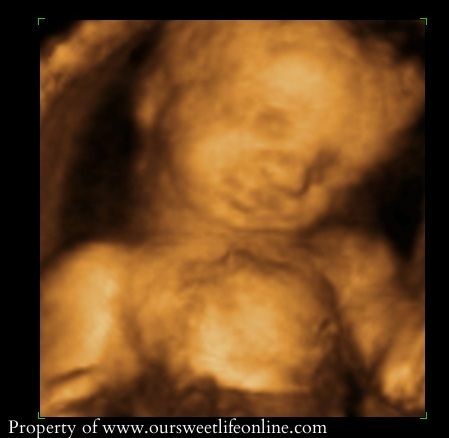 She is still measuring small and seems to like being all scrunched up head down and very low in Mommy's tummy. She also liked to play with her cord in front of her face. She may have been a little shy, but she wasn't modest. Ha! We had a hard time telling who she looks most like, but this picture makes me think she looks more like mommy. I guess we'll see. This picture makes me think of Brody as he likes to shrug his shoulders a lot now. Skinny little legs and arms. This picture makes me think of her cousin, Cate, who also seems to look more like her daddy and Aunt Sherry. She kept trying to turn away like she was shy and didn't want her "picture" taken. 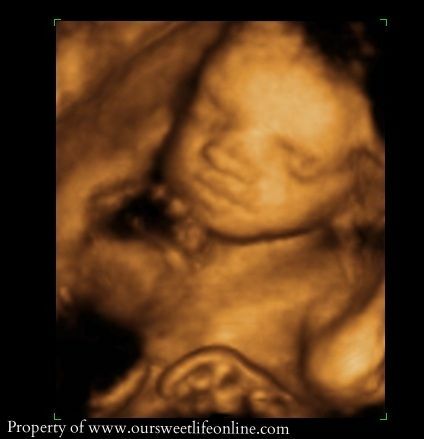 You'll be here before we know it, and we are all so excited. 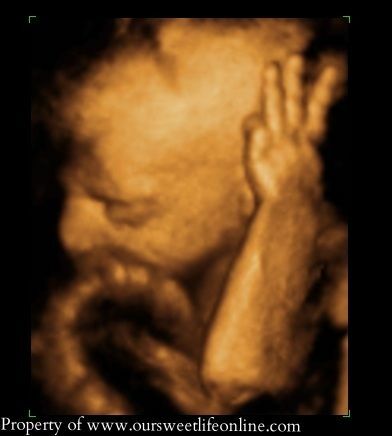 Even Brody seems to be aware of what is coming as he points to Mommy's tummy when asked where his baby is. I know that you will love your big brothers so much. 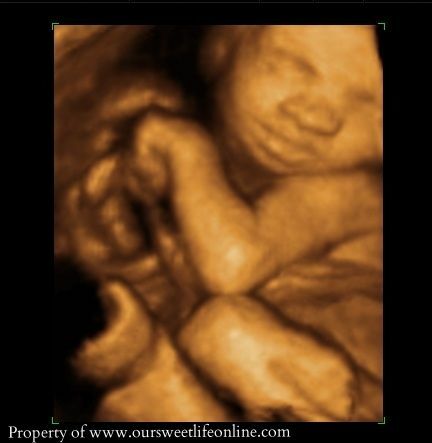 We all can't wait to meet you in about 10 or 11 more weeks. Keep growing! Oh, she is so beautiful!!! It looks like she has very full lips - so pretty! 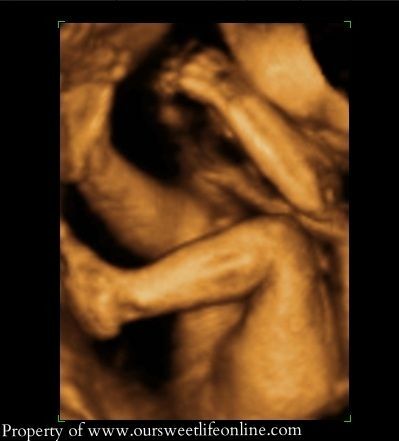 I love how she is holding up 3 little fingers for 3 more months! Thank you, Tracy! I don't know where she got the lips from...definitely not me! Brody has pouty lips (he likes to stick out his bottom lip) which is more my trait, but the fuller lips must come from daddy. That's a funny observation about the 3 fingers...hadn't thought of that! Wow! Those pictures are incredible! How special! Oh, and I just saw your tags for the post. Hilarious! Haha! Big families are great (I'm from a family of 6) and so much fun! Those pictures are amazing. It is so cool what can be done with technology. I wonder what color her hair will be- more reddish or more blondish. Maybe she'll throw a wrench in there and be a brunette (I don't actually see that happening!). I know a family and they have 1 of each. Their mom calls them her neopolitan kids. I love that. Sorry I have been absent from comments. I've been reading- I promise. I've just been horrible about commenting. I'll do better now. I know...wish they'd invent something to give us a sneak peek of hair and eye color, but I guess it is good to let some things be a surprise still. 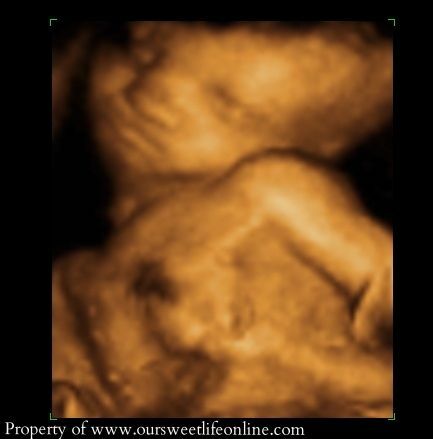 We could tell in the regular 3D images that she has some hair (looks fuzzy on ultrasound). Brody kind of started out a brunette, but he has lightened up a lot in the last year. I guess we could technically get "neopolitan," but I'm kind of partial to another red head. I don't know why I've always liked red hair.